I just received mine today, so it looks like they are making their way through the orders slowly but.steadily. Got mine on Thursday, had no shipping notification though. My first order was placed on Day 1 of the sale, and shipped out 3-4 days later, arriving yesterday. Order #2 has not yet shipped, AFAIK. I received notices that my orders were fulfilled about 5 days after I received the confirmation notices. The Algoran command just cost me another pretty penny. How good are the bases ? I just bought 500 of them for $30. The bases seem to be very thin and flat with a slight ridge around the edge.lots of scope to do what you like on them. Mostly to annoy my friends who religiously only use GW models, I plan on starting a new counts as Tau army using the C3 sprues for Tau Fire Warriors and Gun Drones, the Ghar for Tau Stealth Suits, and the Al Sprues for Vespids. Anyone have suggestions on where I can get 20 pairs of cheap wings that will look good and the Algorin ? For vespid wings you could.try getting a paper punch and using it on 0.5mm plasticard. You'll probably wreck the punch quite quickly, but it should be good for 20 pairs. I don't think I would use punched out paper dragonflies or novelty flies, but if I can find some plastic dragonflies at the dollar store, I may be in business. Someone bought up the Celtic Command Sprues. I hope they noticed that those sprues don't have the heads on them. Maybe they are playing zombie celts with no heads. Like the headless horseman...just crazier. Yeah, still waiting for mine - I think the website said it would about 15 days for oversea orders, so they should show up soon. Also ordered on the 24th, got shipping notice on the 7th, still waiting for the order, but I bet they are swamped. Yeah, they posted a video from Paul Sawyer and John Stallard apologizing for the slowness due to the massive amount of orders they got. My giant box of like 60 sprues arrived Friday! My order turned up last week, they did say when I emailed them the delay was just due to the number of orders received in the sale. Well, got home today and it had come in the mail. Ordered on 8/17, so about 23 days? Just got the shipping notification for the order I placed over the last weekend of the sale. I just got a shipping notice for my order that I received weeks ago. I really hope I won't have to go through the hassle of returning another 200 romans. Stuff showed up today. That's good. 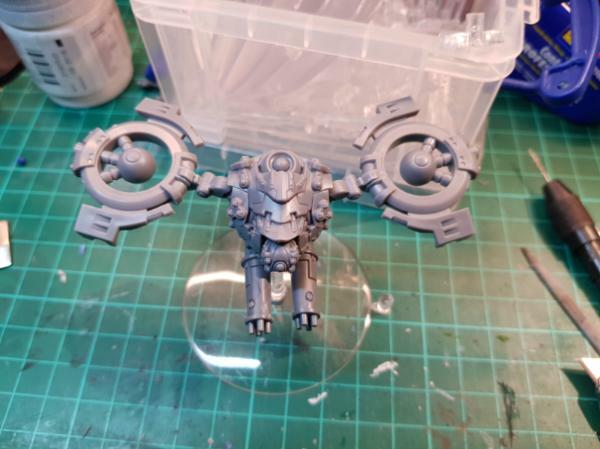 I bought the C3 models to also do a Tau-esque force, but I now I am kind of wishing I had of waited and got the Algoryn instead, as they seem a little bit larger and more in line with GW's Tau. Anyone have any size comparison pictures? The Algoryns are the right size, but not the right proportions. C3 could work as some sort of diminutive client species for the Tau. At least you got 20 awesome drones. Sadly, I didn't see the Algoryns, either. The drones were exactly what sold me on getting the C3. I bought as soon as I saw the sale go up, but it was too early for the Algoryns. The drones are fantastic, and can be easily converted to what I want. Looking at the miniatures, the C3 aren't as bulky as GW figures, but they look much better proportioned, and I should be able to work something out. Height wise, I think they'll do fine. Apparently they oversold stuff so you may not get everything you actually bought. My box came without my 8 modern soldier sprues and I had to email CS to find out why. With my C3, I'm going to do a slight variation on my Tau paint scheme, with the hopes of using them as Gu'vesa in any 40K game. The best thing about super cheap sprue of stuff is that you can just do weird stuff without worrying about how much it cost. I don't see a generic Warlords news thread so here we are. From Facebook - The old Wargames Factory plastic skeletons are coming back! If they are like the samurai, then the sprues will be slightly changed. It’s pictured with 24 skeletons instead of 30 as it is. I really like that these are plain skeletons (no rags or armour on parts) makes them much quicker to paint in large numbers. But I always found them really fiddly to put together, the waist joint is a tiny contact point but has to support a lot of the models weight. Look good once done, and give that Jason and the argonaughts feel with their Greek style weapons. There is a orc box set as well (which is weird as they were selling off the orc sprue in their sales during the year). Good, I need basing fodder. Helllllooooo Skeletons! I was waiting for Warlord to bring these back. They're great as a source for plain bone decoration for all sorts of things. Sadly I only managed to get a single box before Wargames Factory went down. Been a long wait. IIRC they also got the Shock Troopers, they weren't great models, but it was a fun set. Depends on what Warlord asks for them. At thrice the original price, the Shocks Troops won't be much fun. I wonder if they have been retooled to not be so damned fiddly, the originals were such a pain. And that is the real question too. What will Warlord ask for these? I am always interested in more skeletons, and have wanted some of these for a while. Being plain means that you can convert them any which way you might like. But also because they come with open right hands, which is fantastic if you want to make conversions. They are smaller and more spindly than other skeleton miniatures, which is troubling, so I'll have to see how they turn out. The Shock Troops have cool coats and face masks, but the anatomy and posing are certainly not the best. They are fine for generic scary bad guys in various sci-fi skirmish games though. And yeah I would not pay a lot for them, the ones I got were something like $0.7 per model. Yes, Greek skeletons! Children of the Hydra here I come! Same. Would really like to finish off my Tomb Kings and the rags on Mantic skellies don't look the part. But I'm not paying 15 quid for 10. Hopefully they'll still be low-cost - even beyond my undead army, I've found unadorned-bones skeletons tremendously useful. Especially now that I'm working on Fallout terrain and I don't have much of my original stock of WGF sprues remaining. Hopefully. A price increase over Wargames Factory is inevitable, but maybe the skeletons will be a horde unit in that fantasy game and priced accordingly. Both those and the Orcs are at £20 for 24 models. Not worth it in my opinion. Equally Wand Action definitely has my interest! The Orcs are some of my favorites. I will probably buy some more at some point. Their hands aren't great, but their faces and proportions are fantastic. Wait, what??? Anybody know anything about this game? http://wargameterrain.blogspot.com/2018/11/breaking-warlord-games-new-warlords-of.html Called Warlords of Erewhon and seems to be Gates of Antares/ Bolt Action in a Fantasy Setting. I'm well up for it! Wonder if there will be a samurai force in this world . Probably some Amazons, too, eh? What does 24 pounds translate to in USD according to Warlord? $30? $35? It seems like a mistake to charge more than $1 per skeleton. You get bases too Bob , but a quick look on their web page and switching back and forth on currencies had a £23.50 box being $38.00. There will most likely be cards, dice, tokens etc. Yup, that's when I think I'd want to pick them up. At the price they are asking it's too much. Oh well.